We're entering the biggest shopping season of the year. Unfortunately, this is also prime season for package thieves. The Hayward Police Department reminds you as you're making online purchases over the next few weeks, follow these tips to avoid becoming the victim of package theft. 1. Sign up for delivery alerts so you know when your delivery is scheduled - and when the package has been delivered. 2. 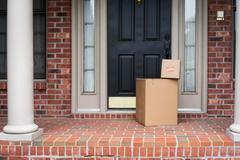 If you're not able to be home when a package will be delivered, ask a trusted neighbor to hold it for you. 3. If possible, require a signature for all deliveries. 4. Consider shipping packages to your place of work or use the ship to store option. Also consider picking up packages in person. 5. Be a good neighbor! If you see a package on your neighbor's doorstep, reach out and ask if they would like you to hold it until they are home. 6. Install security cameras. Add a smart doorbell or purchase a security device that lets you monitor your doorstep for activity. Please be vigilant during the holidays and report any suspicious activity to the Hayward Police Department at 293-7000. If you do have any packages stolen, first contact us and then check with your neighbors to see if they saw anything suspicious.